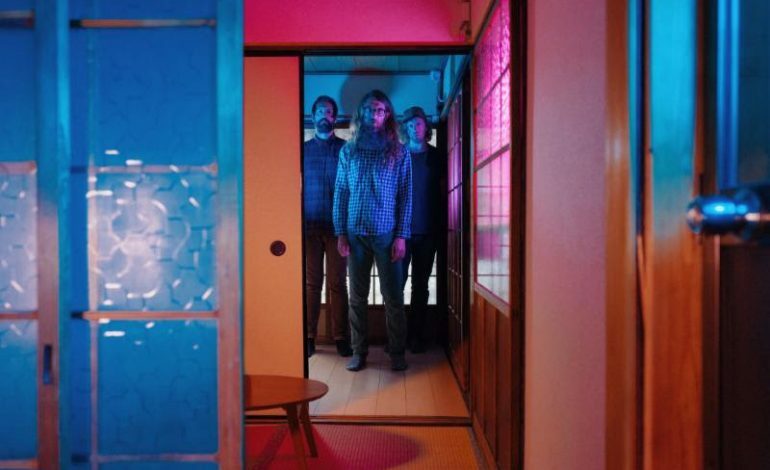 Maps & Atlases have returned for their first new album since 2012, titled Lightlessness Is Nothing New. The record came out at the beginning of June on Barsuk records and is a triumphant return for the band that began as math-rock stalwarts but eventually grew into the alternative pop machine that it is today. We had the chance to talk to lead singer Dave Davison about the upcoming album, the evolution of the band and playing as a trio. mxdwn: How did Lightlessness is Nothing New go from a solo project to a group effort? Dave Davison: I was just recording it and not knowing what exactly it would be. Not knowing if it would be a solo release or some other type of release. As time went on I had some beats that I made that were kind of place holding as something that might eventually come. As time went on I thought maybe Chris would like to come play on this. And he came and was doing such a great job. After hearing it with his drumming on it, it was a pretty quick transition because I was like, we’re already in a band together and I’ve been playing with this person…It’s kind of funny because it seems pretty outside of the realm of what we had done previously but once he started playing on it, it was like, okay this could make sense. It was a pretty natural transition. mxdwn: When the band first came out you were known for the math-y compositions and the instrumentation but now the focus is more vocal..was this a conscious decision or just an album to album evolution? DD: Well I think its been a seamless growth for us in general. We’ve grown with the music we listen to. We’ve listened to lot of different music together. From our earliest music I think we kind of found that what we really like doing together is experimenting with different ways of rhythm and playing off of each other and doing lots of different things that seem new to us. And with that and having the two ideas of making something new and interesting and exciting and experimental and having that while trying to makes something fun and meaningful and welcoming to listen to. Having that where you can have a very song-centered approach while at the same time continuing to experiment with our instruments and having new ways together at the same time has been a guiding concept through all of our music. This album is a continuation of that in a new way. mxdwn: How does this album compare to Beware and Be Grateful? DD: They have similarities in the sense that our past couple of albums have always started with me having some basic ideas and at some point being like, I’m not really sure if this is right. And then ultimately coming into a place where everyone is adding things and making it a more rich and collaborative vibe. I think it’s different in that we finished the record with a guy named Scott Solter who is a very interesting and talented person. Who in many ways not only exposed us to a lot of new music and new elements but gave us a chance. His methods and insights into the recording process brought out a lot of new elements to our music and new textures we hadn’t used before. We learned a lot for sure. mxdwn: How has the response to “Fall Apart” been? DD: I hope good. I think one thing that’s unique so far about the response that I’ve gotten in my personal life is through people who heard it through the premiere; friends of mine. They said they could relate to aspects of it and I’ve heard that before but this time there’s more of a response to the content of a song by people that I know versus the sound of the song which is really cool. It makes me happy that people are responding in that way. I don’t know if that’s the general response but its good to hear from friends saying I can feel where that’s coming from right now for various reasons. That was cool and meaningful. I hope people like it. mxdwn: Why release “Fall Apart” as the first single? DD: For me it seemed like that was the first song that when Chris played on it, it really clicked for me that this has the potential to be something really new for us to do together. It has some challenging guitar parts. It has a lot of different rhythmic things happening that seemed like they could be really fun to play off of together and I think it just represented the potential for us to play together in a way that would be fun and bring out the strengths of everyone in the band. On a basic level it made a lot of sense. Musically it’s a representation of where the album was going. It also is just a fun song that hopefully is interesting. mxdwn: Is there a song you’re most excited for people to hear? DD: I’m excited, there’s one song called “Ringing Bells” I really like. I’m excited for all of them but this song is really intense to write and the sound excites me. I’m most excited about songs that seem as the person who made them you still feel like you’re listening to something that’s outside of your ability. A lot of the time you work on something and you see the gears and when you listen to it you’re focused on the creating. It’s hard to step back. It’s like the difference between a meal you make yourself and one you get at a restaurant. At the restaurant you get it and you’re like, wow this is amazing. But if you make it yourself you’re just focused on how you made it. Certain songs whether they happen really fast or really naturally you can just step back and hear it and feel like you had nothing to do with it. And that song is really personal and its like cool, here’s this song, it’s in the world. mxdwn: How has the band evolved since its inception in 2004? DD: We formed in college. And we were playing for fun, well we still are playing for fun [laughs], but we were playing and no one was listening. We’ve done this for so long we’ve totally changed as people and our concept of what we like musically has changed. Everything has changed so much, but certain things are the same I guess. We still try to focus on making music that’s musical and growing together. You know just having fun and experimenting with things. That’s remained the same but almost everything else has changed. I feel really fortunate when I think back to when we started playing together and we could’ve just said I’m gonna focus on school or this or that — I’m glad that we stuck together. I feel really fortunate to have these people who I’ve experienced so much fun with and grown with. It’s been a very valuable experience. mxdwn: How does playing as a trio compare to playing as a four-piece? DD: I think it’s been interesting because early on so much of our focus was on locking in with the other guitar on certain harmonizing parts which was a really cool challenge. But it’s been interesting to figure out how the space will be occupied by the guitar and by everything else. We still have some elements of the locked-in-ness but there’s also a looseness that’s come into our playing that’s been really fun and exciting as well. Some of the ways that we improvise and jam and stuff live have really changed, looser in a really different way. There’s more room for spontaniety and you have to rely more on each instrument to fill more space, especially guitar. We were playing a festival that was really cool. It was outdoors in the winter and the stage was supposed to be heated but it ended up being a really cold day. My hands were so cold and I was having a hard time playing certain parts and I was thinking to myself this would be a really good time to have another guitar. But this has been a cool challenge. Obviously I love playing with Aaron, but he’s doing his thing now with film and music and we’re still good friends. mxdwn: What else do you have in store for 2018? DD: I don’t know I guess we’ll see. We’re going back on tour and going to be doing a lot of shows. We’ll use this opportunity to create a lot of new stuff in general. Our drummer, Chris, is a very talented visual artist and has some very ambitious ideas for everything visually around the album. Doing a lot of that and a lot of other stuff around the album and yeah it should be fun. I’m especially excited to go back on tour because it’s been a little while. I’m sure there are many new restaraunts and places that we don’t know about. We’re just excited, should be fun.